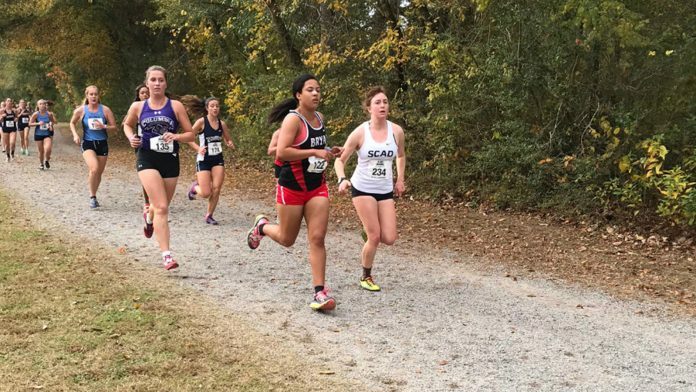 Canton, Ga. – Isabella Dawson was the only Bryan College Women’s Cross Country member to nearly place in the top-50 runners during the 2017 Appalachian Athletic Conference Women’s Cross Country championship meet, finishing 53-of-100 at a time of 22:09. The 5k event was hosted by fellow conference school, Reinhardt University, and took place at Boling Park. Only a few spots back from Dawson was Elizabeth Thompson, who crossed the finish line at 22:42 for 58th. Next in line was former Rhea County High Schools’s Sarah Kinzalow with a time of 25:29, sealing the 84th spot. Bethany Truax ran a 28:39 for 90th, and Jordyn Elardo rounded out the group at 98th by completing the course in 33:50. The Lions averaged a time of 26:33, which was good enough for 12th place overall. On Tuesday, the league announced the 2017 All-AAC Women’s Cross Country awards and two Lions earned honors. To be voted to the AAC Champion’s of Character Team, an individual must represent the five core values of the NAIA Champions of Character program: integrity, respect, responsibility, sportsmanship, and servant leadership. Elizabeth Thompson was the Lion’s representative to the Champion’s of Character Team this year. For her efforts in her studies, Xia Grimwood was named to the All-Academic Team. This award is presented to all student-athletes who excel in the classroom. Nominees must have completed two terms of attendance and attained a grade point average of 3.25 or higher.